During these years the picturesque “Directoire” style evoking the late 1700’s and early 1800’s was revived. 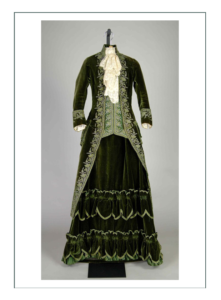 Directoire elements included tailored redingotes cut back to expose a contrasting skirt, embroidered and brocaded vest effects, dresses with empire waists, and puffy fichus. 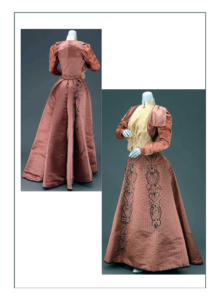 As time went on there was increasing emphasis on fancy sleeves; inspired by the 1830’s which were in turn inspired by the 16th century Middle Ages. 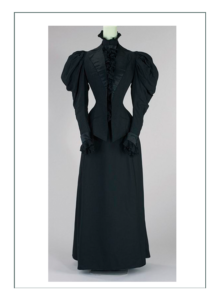 Fashion of the 1890’s overall is characterized by long elegant lines, tall collars, and the rise of sportswear. 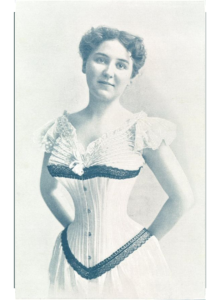 Both the extremely tight and fitted corsets and fussy bustle styles existed alongside the rise in “naturalness”; inspired by the “Rational Dress Movement” which was widely discussed for womens’ health in 1891. 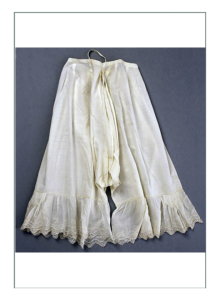 The “Rational” movement led to the development of bloomers and the sports dress. 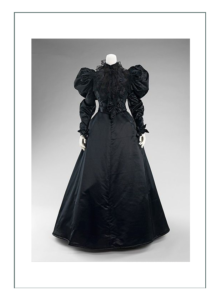 The Silhouette progressively deflated from that which had considerable back fullness and puffy drapers, to the narrow one of the early 1890’s. Foreign fashion brought influences, especially the red tunic, the “curiasse” bodice, and the “Prussian” very high neck collar. 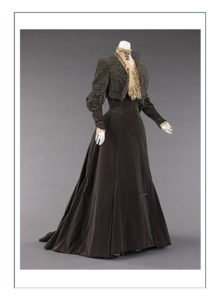 The 1890’s were an era of great dress modifications with unfussy, tailored clothes, adapted from earlier themes in men’s tailoring. This sharper tailoring, combined with gigantic sleeves and huge hats, gave women a posutre that made them look more confident. 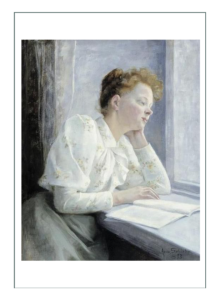 This reflected social ideals such as emancipation, sufferage, and marriage rights along with higher education for women and women in the workplace. It also put women off balance. Overall simplicity in the form of the clothing became dominant, especially for those worn for outdoor activities and travel. 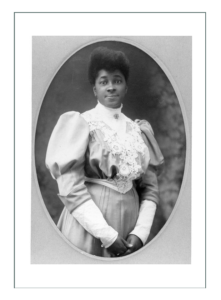 The working woman embraced the tailored coat and skirt later called a “suit”. 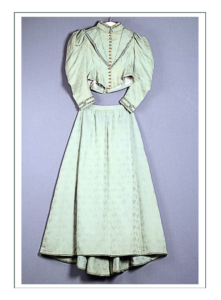 This shirtwaist, a costume with a bodice or “waist” tailored like a man’s shirt with a high collar, was adapted for women’s informal day wear, and became the uniform of the working woman. 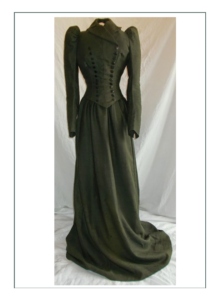 The tailor-made woman’s suit of the 1890’s had a 3/4 length jacket, wide revers, enormous sleeves, a plan skirt that reached to instep or ground, and might also sport a waistcoat. 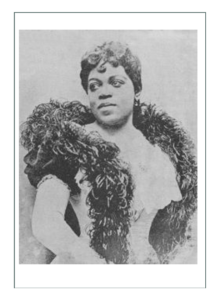 later in the era, and despite intensive marketing by French fashion houses and American periodicals to keep it out of popularity, the tailor-made suit elevated the combination blouse (“shirt waist”) into high fashion. 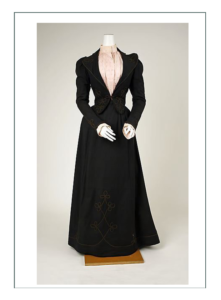 The “suit” by the end of the 1890’s had become acceptable attire in all venues from walking out to high tea. Walking Suits featured ankle length skirts wtih matching jackets. 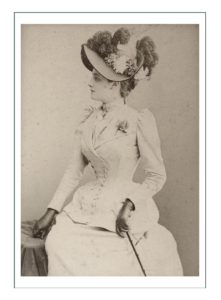 The blousewaist, worn with the suit jacket or withouth, became popular in 1894. It was caught in at the waist with a fixed belt, and then a short peplum would extend under the belt. Ready-made blouses could be bought in great variety from very masculine and tailored to dressy an fussy for formal wear. Most ready-made and catalog blouses thanks to the new scientifically based sizing systems, now actually fit. Some think the demise of the bustle was because its wearers and fans were aging and dying, and a new generation was coming into vogue. 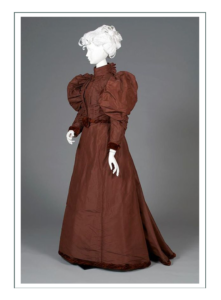 The bustle was entirely gone by 1890, and only a small pad to lift the rear skirt fabric was left by 1893, with cartridge pleats to add fullness in the skirt fabric itself. 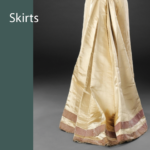 These gathers and pleats remained until about 1900. 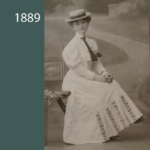 In 1885 the skirt had become very stiff, fitting over the hip and shaped into thick umbrella-like pleats. 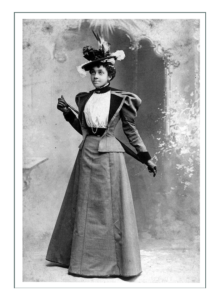 The shape of the skirt gradually slimmed down by the end of the 1880’s until by 1890, skirts fell naturally over the hips. 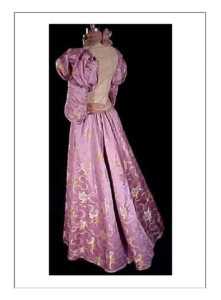 Through the period they changed from wide, horse hind shapes to a gentle and graceful bell or “inverted lily flower” which fit closely over the hip and then flared just above the knee. The skirt continued to widen and flare as the fullness of the bustle turned into a fall of pleats instead. Skirts widened into a straight line after the hips to start the hem flare. They were gored, not gathered any more, to give a fairly close-fitting effect over the hips. 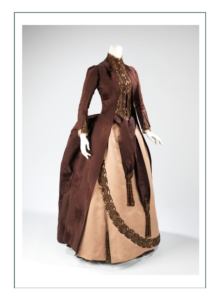 By 1894, skirts were mostly free of decoration, but after 1894, decorative panels extended from the bodice and continued down the skirt with braid or fringe at the edge of each panel. 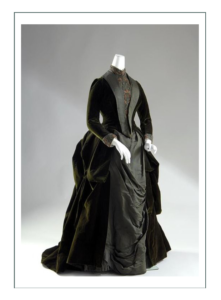 By 1899 the flare in the skirt was more pronounced and dramatic; many had shaped flounces that would carry over into the 1900 fashions. 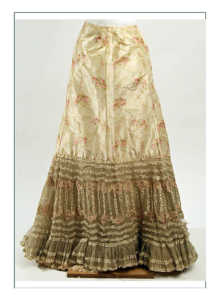 Many skirts had trains for both day and evening wear after 1899. 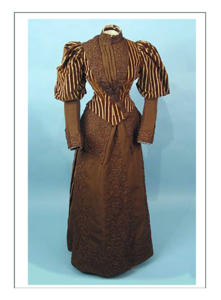 Dresses of the early 1890’s had tight bodices that were gathered at the waist. After that, they had even more fullness in the front, which would develop into the pigeon breast of monobosum of the early 20th century. 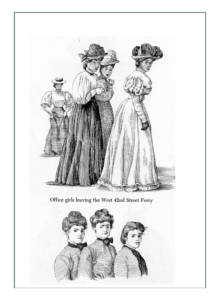 By 1897, most bodices were gathered evenly all round at the botoom and had a belt which went mostly straight around. 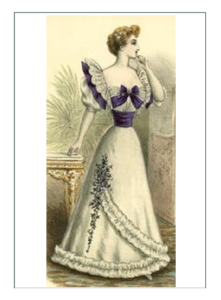 Some had lace jobts and frills including cross-overs or epaulettes of military influence. 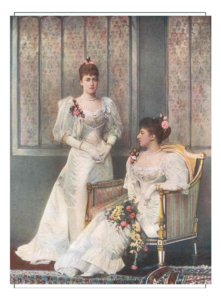 The bodice shape itself hardly changed until 1907, so there was a basic design from which all just varied. Variasions included square or round necklines. 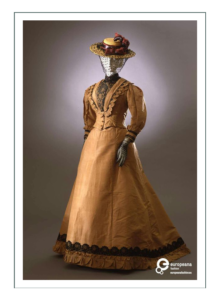 Necklines rose higher through the era, and collars were very high and boned. Peplums of various lengths and shapes were popular mostly in 1894-95. These were “fan” like folds of fabric over the top of the skirt. The Zouave jacket, still popular from the 1860’s became more tailored at this time, and had bottoms either square or rounded. 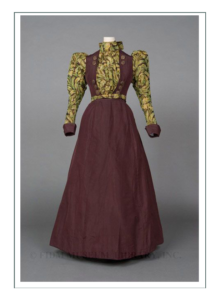 By 1889 sleeves were huge and needed support. 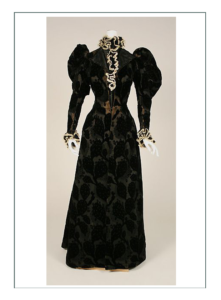 The 1894 sleeve puff had become enormous, and the fullness dropped level with the shoulders rather than going upwards as in previous eras. 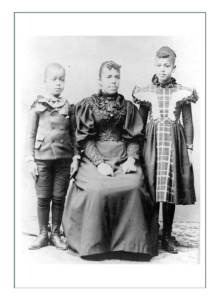 Sleeves got bigger and bigger until they “disappeared” in 1896. The 1898 sleeve was slender, and the head was cut with a built in puff. 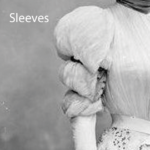 By 1899, sleeves were slender. 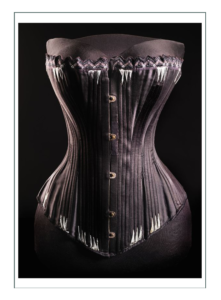 The early Edwardian corset was the same as the prior era, except the bones did not follow the seams of the pattern pieces since the aim of the Victorian corset was to smooth the line of the body, while the Edwardian was to emphasize tiny waist and large hips. 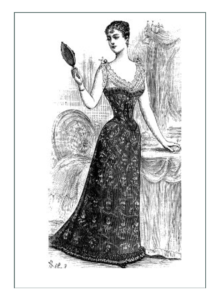 Being cut with separate hip pieces, the 1890’s corset results in a “nipped in” waist appearance. 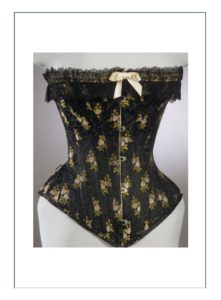 Although not intended to be visible like stays of the 18th century, corsets of the 1880’s to 1890’s were elegant and beautifully made. Black sateen was sewn with yellow, blue, pink, or green decorative machine stitching,and them embroidered by machine or hand. Throughout the 1880’s to the end of the 1890’s women’s underwear became more elaborately trimmed and progressively prettier and more alluring. 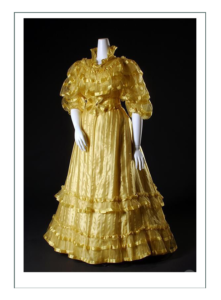 The decorative period culminated in the 1890’s with “frou-frou” (silk taffeta) petticoats. 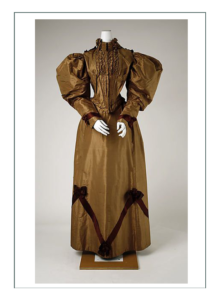 By 1890 the chemise and drawers were almost completely replaced by combinations because a combination reduced bulk around the waist. 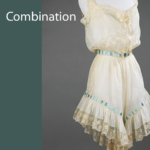 A combination was a camisole with attached knee or calf length drawers. 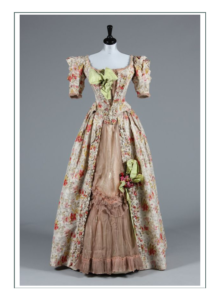 Combinations were worn under the corset, bustle, and petticoat. By 1899 some drawers were wide-legged and flared. Drawers and a camisole might be worn instead of a combination. 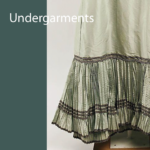 The drawers, now called “knickers” in reference to the Reform Era bloomers were worn. 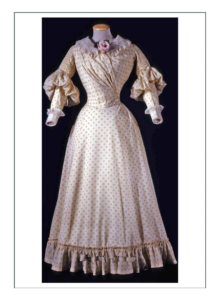 Whether wide or narrow legged, drawers used flat lace, inserts, or ribbon on the hems to pull in fullness so as not to disrupt the line of the dress instead of ruffles and edging trims of the past era. Knickers and combinations were split at the crotch to allow use of the now common indoor plumbing. 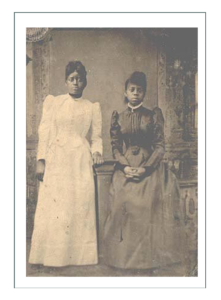 they had a straight or slightly “v’d” waist band to keep the front waist area flat. 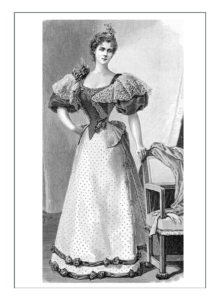 In the 1890’s a short-sleeved or sleeveless under-bodice and over the corset light muslin or silk blouse called a camisole was worn. When this was worn, knickers were worn instead of a combinations. 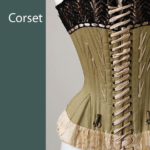 The corset cover (camisole, petticoat bodice as other names) was worn over the corset, it protected the tight fitting dress from being damaged by the metal parts of the corset rubbing. 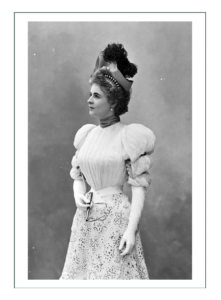 In the 1890’s corset covers were very glamorous with frills, tucks, lace trimmings, and ribbons. 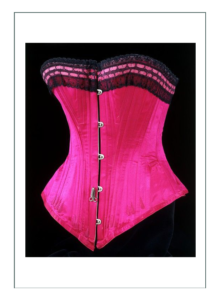 Undervest of colored washable silk with shaped gussets for breast were worn under the corset to absorb sweat and prevent chafing. 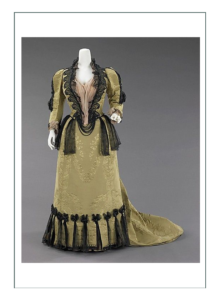 By the end of the century, the chemise had become a very simply cut, sleeveless garment with narrow shoulders It had a round, square, V, or heart-shaped neckline, and was highly decorated with lace and embroidery. 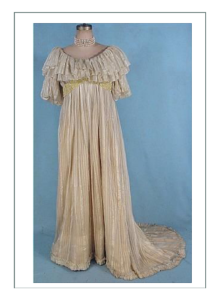 It was made of fine cotton, linen, or silk. A separate type of chemise was worn with evening sleeveless dresses. The evening chemise was cut straight across the top. with a separate narrow shoulder straps which would remain popular well into the 20th century. 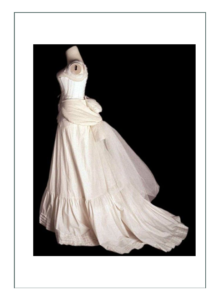 The petticoat was made to stay as flat as possible along the front to maintain the smooth line of the bodice. The triangular silhouette of the gored petticoat was further emphasized by a lace-trimmed frill at the bottom. 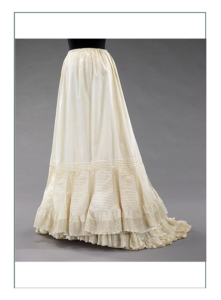 As skirts softened in outline in the late 1890’s, the petticoats followed the shape to give a curved flare below the knee. Petticoats often had circular flounces at the bottom. 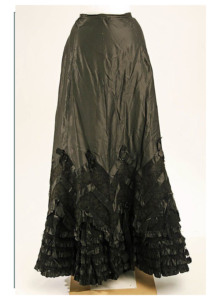 This straight, curve, flare, flounce line would characterize skirts and petticoats until about 1914. Stiff silk or alpaca wool petticoats were worn, although cotton was most common. Flannel was still a favorite, although it was often too bulky for the slim line of the style. 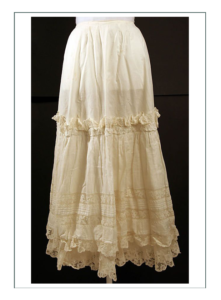 Silk petticoats produced a characteristic rustling sound that marked the 1890’s. The sound was called “frou frou”. Lace, gauze, a thick silk called mousseline de soie, ribbon, silk chiffon, tulle, crepe de chine, and specially made lace details were used. 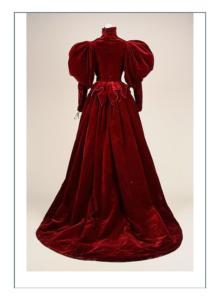 French high fashion had extremely expensive gowns in velvet and satin. 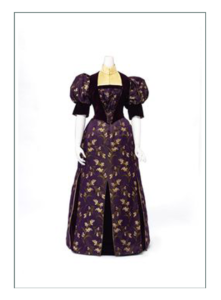 Gowns of the 1890’s were in vivid colors produced by the new and innovative dye processes such as deep red, peacock blue, bright apple green, royal blue, purple, mandarin, sea green. They were often combined with tartan plaids and contrasting fabrics. Some color combinations were strange to our modern tastes. Matching jewelry included Renaissance pieces including Greek, Egyptian, and other ancient societal works. There were corals and cameos and many, many designs used in brooches, earrings, necklaces, and pins. 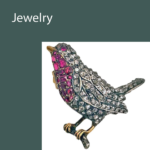 Jewelry was often worn over gloves. Sentimental jewelry was made from the hair of a loved one. Women put their hair from their brushes every day into a box, and when they had enough would weave a necklace or bracelet from it. Victorian jewelry was very complex and ornate with diamonds and emeralds. Paste was very popular for every possible event and outing except when participating in sports. There was a huge industry worldwide for making paste jewelry. Parasols were used for everything but active sports too. The difference between a parasol and umbrella was that the umbrella was large enough to protect from sun or rain. Parasols were strictly for looks. High heels were a necessity for any woman wanting to keep her dress clean. The modern high heal appeared at this time. It evolved from the “clog” from Henry VI’s day and boots of eras preceding. The higher back of the “heeled clog” threw the weight forward, contributing to the Edwardian off balance “S Monobosum” look around 1900. 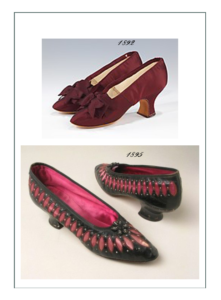 High tab front shoes with a large buckle went out of style in the 1870’s, but came back in the 1890’s. Except for the shape of the heel, the ’90’s shoe was almost exactly the same as that worn 100 years earlier. 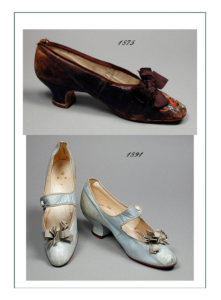 Heeled shoes therefore had names referencing the 18th century like the “Cromwell,””Colonial,” or “Moliere”. Suede, leather, lace, and metal were used for the shoe itself as well as decorations. 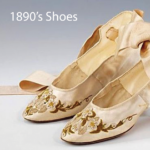 Suede was new to the market in 1890, and was available in a few pale shaes. Boots, previously worn strictly for riding, work, farm, or pioneer, were commonly worn by women now for sports, work rural pursuits, and travel. They were readily available and mass produced. 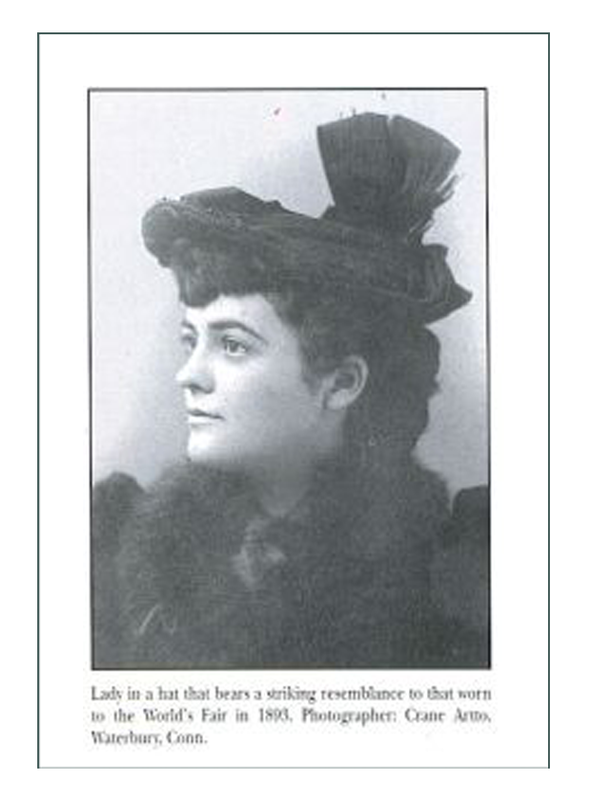 No self-respecting woman of Victorian or Edwardian eras would leave home without a hat. Women wore their hair very long, and only young girls wore it loose. Early Victorian styles featured a center part with sides swept up over the ears. Depending on the time of day hair might have been coiled on the back of the head, or curled around the face. Hair was fastened around pads. Styles included curled or frizzled bangs over the forehead with hair swept well to to top of the head. 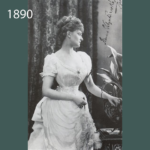 After 1892, hairstyles were increasingly influenced by the Gibson Girl, a standardized made up woman who epitomized the supposed ideal of the day with huge hair, voluptuous and strong body, and a meek and mild disposition. Hair became looser and wavier after 1895, and bangs gradually faded from fashion. 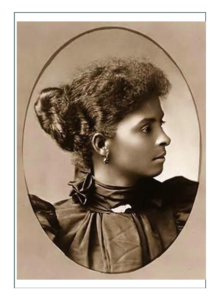 By the end of the 1890’s the hair was often worn in a large piled mass with a bun at the top to hold the hat. This style would predominate until after 1910. 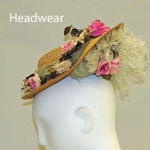 In the 18th century hats were an expression of one’s job, perceived self-status, or personality. They were almost universally worn, since people did not wash their hair often, and caps kept greasy hair out of the face. 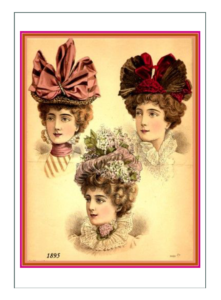 By the early Victorian Romantic Era (1837-1850), bonnets (defined as having crown, brim, apron, and “bavolet” back curtain rather than a structured form with height or breadth) were in fashion and “hats” were out. 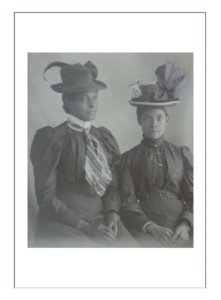 Young women wore hats as only informal or outdoor functional wear but by the 1860’s “hats” came back into fashion and replaced bonnets. 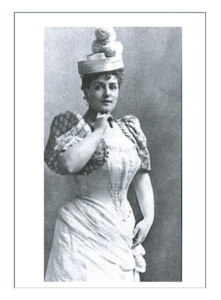 High crowned hats with turned up brims were in style in the 1870’s, and were generally worn tilted forward or towards the rear of the head depending on the hairstyle. 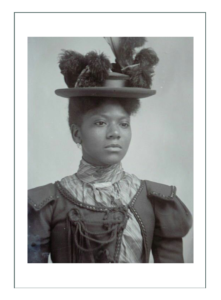 In the 1870’s, hats featured feathers, wings, and whole birds. The “Mercury” style had wings as the main ornament. 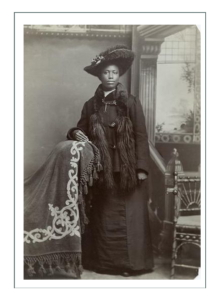 The hat itself was made from felt or velvet, and sat well back of the head to show off the hair in front. Trimmings in the late 1870’s were arrange to give a vertical line, which is when the bizarre birds and feathers appeared alongside fruits and vegetables. 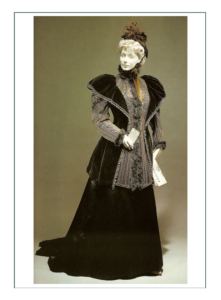 Fur and sealskin were popular going into the 1880s. Yachting and masculine hats like caps and the “tam o shanter” (a soft round cap with brim and bobble in the center) appeared for sports at this time. 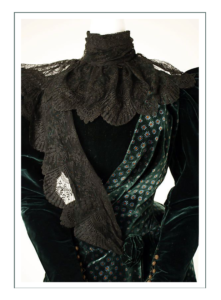 In about 1885 a popular style was made from felt and feathers too, but added a gauze or net mesh over the face. These veils secured the hat to the head, and kept the tilt of the hat forward. The net kept the hair in place too, but physicians warned women would go cross eyed looking through the net, but no records of such were kept. 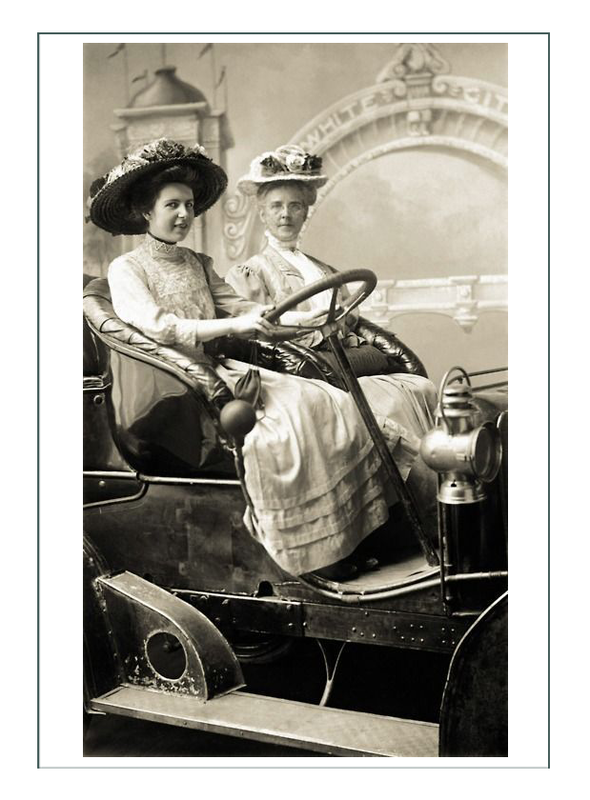 The “Alsatian” bonnet was popular in the 1890’s. It was simply a giant bow attached to a bonnet too small to be seen. Ornamentation at this time varied greatly, and as the years progressed, the hat sizes changed. Ribbons and bows gave way to feathers and whole birds, especially owl heads, and stuffed full birds such as baltimore orioles, hummingbirds, blue jays, woodpeckers, and prairie hens. Animals such as mice and small reptiles were worn alongside plumes, wings, and multiple birds. This slaughter of birds led to environmental activism and the creation of the Sierra club. 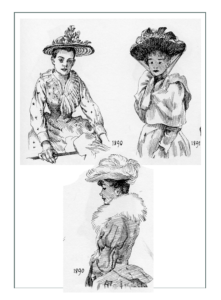 That did not stop women from wearing them as they considered hats and expression of their personal “style” and as a work of art. 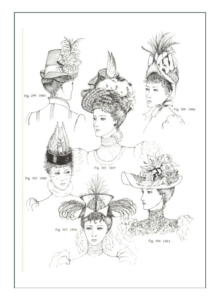 Shape and style of a hat was dictated by hairstyle. 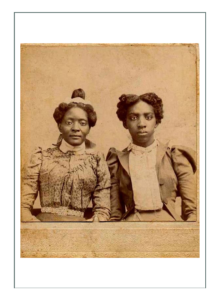 When the hair was in massive amounts on the back of the head as in the late 1860’s or early 1870’s, bonnets were worn forward. 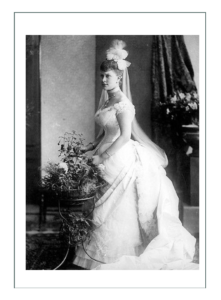 In the late 1870’s into the 1880’s the crowns rose because hair became “high dressed” with fringe. 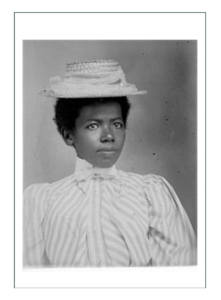 By the 1890’s, bonnets lost favor and hats with broad brims were worn high on the head over the full hairstyles. These were often draped or ruched in velvet or silk. Most hats still had narrow brims, but crowns grew higher and higher. 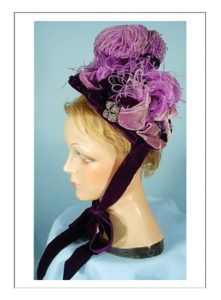 The “Victorian Tall Hat” was popular with feathers and upright bows and stiffened fabrics. The passion for dead birds continued until the late 1890s. By 1900 hats were enormous, and hair had evolved into elaborate affairs requiring “rats” (hair stuffed forms) and hair pieces. 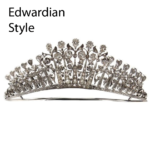 Short hatpins of the 1870’s and ’80’s were now 18″ long to get through the brims of the Edwardian hats, and people complained of the danger of hat pins on streetcars, and blocking of views at theatre and public places. 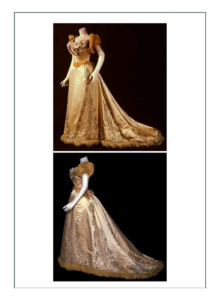 The years between 1890 and the beginning of the first World War have been known as “La Belle Epoque”, but in reality the time spanned the end of the Victorian Era and the Edwardian Eras, with more than 5 different factions: high fashion, working women, Edwardian “Dames”, Art Nouveau, and Reform/Aesthetic or alternate fashion movements. 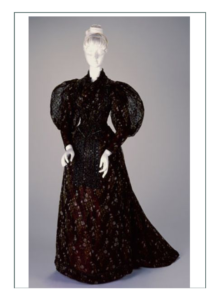 It was now possible for the middle classes in America to be as fashionable as the rich, and the abundant use of embroidery, fur, and large quantities of lace reflect the general opulence of clothing at the time. Ready-to-wear clothes could easily be bought from large retail and department stores as well as catalogs. The Army and Navy stores in particular carried everything from a wide range of clothing to household goods as well as furs, knitwear, and mantles (coat departments). These were advertised alongside clocks, prams, and lamps made to burn oil or electricity. 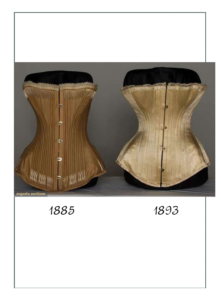 The shape of this period more than most was made by the corset. The aim was to make the hips more rounded and he waist as small as possible while flattening the abdomen and encasing the body in a more upright position. 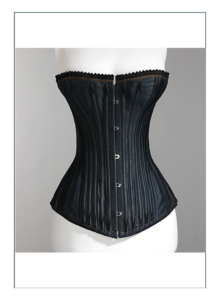 The metal spoon busk curved the corset in at the bottom so the corset bottom did not protrude to make a lump in the front of the skirt. 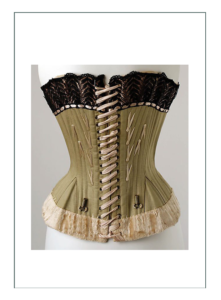 Hand made corsets were beautifully embroidered at points where the bones might poke out, and they were still made using baleen (cartilege from a whale’s mouth), although metal was being introduced. For day and evening wear the bodice was built on a boned foundation. 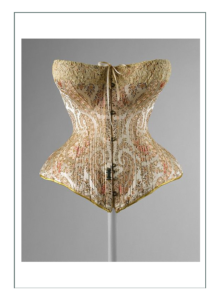 The back of the bodice was mounted in with the foundation, while the front fastened independently down the center. 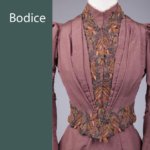 The bodice fabric was then arranged in whatever was the style. Some were draped across and fastened at the side; others had a false “bolero” filled in with an imitation blouse or “chemisette”. Necks were finished with the high stand collar (or military influence), although plain round or high “v” necks with collars and ruff like frills were also popular. The bottom of the bodice could be straight with a belt or have a slight dip at the center front. 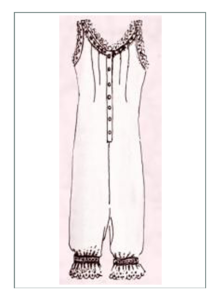 Sleeves were long with two pieces seamed, or with fullness cut off at the top near the shoulder to make a sausage like head with smaller pads down the arm. This sleeve was the forerunner of the leg-o-mutton sleeve which established itself in 1893. The leg-o-mutton sleeve was made in one pieces with the seam inside the arm, similar to the 1830 gigot sleeve, or it could be cut with a large top puff mounted on a two-piece lower sleeve section. By 1894 the puff had become enormous and dropped level with the shoulders rather than going upwards as it had in 1891-93. 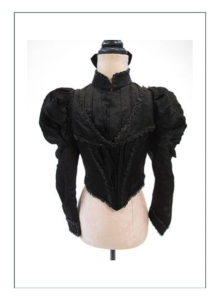 The head was then covered with extra frills or a flounce or revers coming across from the bodice. All sleeves were well fitted and set close to the body at the shoulder. 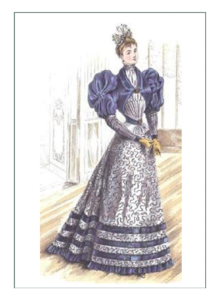 The bustle having finally disappeared, the shape of the skirt at the beginning of the 1890’s was a slimmed down version of that of the late 1880’s. It fitted over the hip, the fabric being cartridge pleated in at the back and pleating acting like a small rump pad. 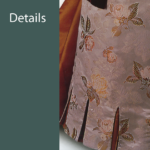 Decorative panels extending from the bodice, with the braid or fringe on the edge were popular. 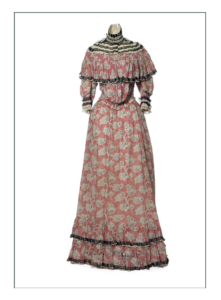 Evening and ball dresses were worn with and without trains. 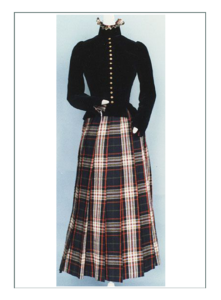 By 1895 the skirt became very stiff and fit over the hip to be shaped into umbrella like pleats. 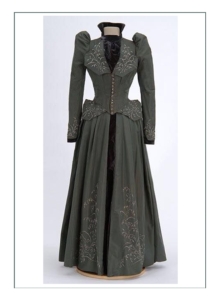 Peplums of various lengths were popular on the bottom of jackets in 1894-95, covering teh top of the skirt which in 1895 was relatively free of decoration. 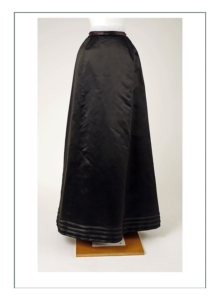 The Zoave jacket, popular from the 1860’s, came back into fashion, but this time it was more tailored with a square or rounded bottom that was fastened by frogs or tabs, or left unfastened. 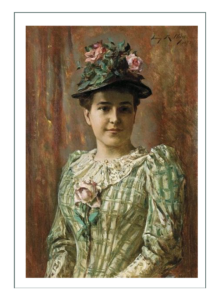 In America by the early 1890’s, women were aware and interested in what the Europeans were wearing, but they had a much more functional “twist” on fashion.